You won’t get pinched if you remember to wear green on Friday. You will have a fun Friday if you remember it is St. Patrick’s Day. Martin McIntyre wants to be absolutely sure you’ll have fun, and invites everyone to spend the afternoon or evening with him. There’s to be plenty of Irish food at the pub, located on Park Avenue in Okinawa City, near the New York Restaurant. McIntyre does the cooking himself, and will be serving up corn bee and cabbage dinners both Friday and Saturday, as well as traditional Irish beef stew. 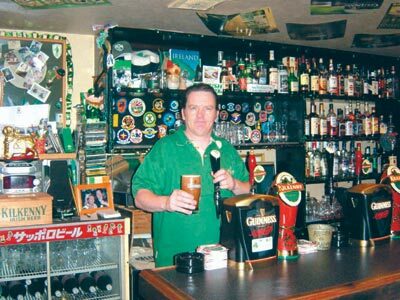 An Ireland native who’s been on Okinawa some 10 years now, McIntyre promises to open his doors at 2pm St. Patrick’s Day, and then serve pints of Guiness and Kilkenny starting at 7pm for only Y700. There is a Y1,000 cover charge Friday. The friendly McIntyre, who seems to never stop talking as he’s trying to make his customers smile and laugh, says the fun continues on Saturday, with a Y5,000 price for an all-you-can-eat-and-drink evening from 9pm to Midnight. There will be plenty of give away action, he promises, as well as a live band. The Irish Pub is opens at 6pm Tuesday through Saturday, and 7pm on Sundays. The pub is closed on Mondays. McIntyre also reminds everyone to mark March 25th on the plan-ahead calendar. That evening he’s featuring the Islanders, an Okinawan Irish music band.